**CLOTHING POLICY APPLIES** You must wear close-toed shoes, no loose clothing, long hair must be safely secured. 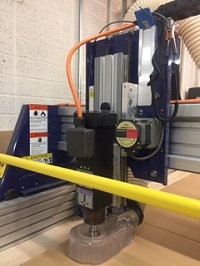 Join us for a Guided Practice session to work one-on-one with staff using the Shopbot CNC! All patrons are required to attend a CNC Tool Orientation before becoming eligible. *YOUR FIRST GUIDED PRACTICE WILL BE AN UN-AIDED DEMONSTRATION OF YOUR ABILITY TO COMPLETE OUR TEST FILE! * Upon successful completion you are eligible to start your own projects. Space is limited, registration is required to secure your spot. Registration is open to one time slot per person per week. Please utilize BLDG 61's Drop-In hours to prepare your file in advance of your Guided Practice timeslot. Your work and the machine must be cleaned up and ready for the next patron on or before the end of the hour.